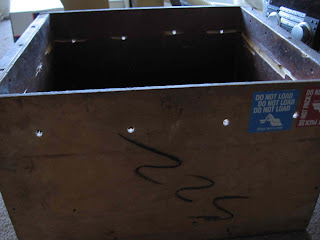 The second post on composting in 2 days! For as long as I can remember, my dad has had a back-yard composting bin. This is yet another one of his habits that I must admit I wasn’t always a willing participant in (like the reused wrapping paper), since he made us trek out to the yard and dump the stinky scraps. But, not surprisingly, with age I realized how amazing it is that we can “close the loop” on at least some of our trash—not only keeping some of our food scraps out of landfills, but also turning them into super-rich soil. Eventually I started to long for the day when I have a house/yard and can build my own composter (will go nicely with that laundry line I’m waiting for, too). I assumed there was no way I could compost in an apartment. But, my sister has had a long-time interest in composting (see below!) and started nudging me about worm composting. For a while I resisted, because, well…as “treehugging” as I may appear, I’m really not a creepy-crawly kinda person. I was never one of those kids who was all cool with letting bugs and worms crawl all over me, ya know? And to have them in my apartment? Ewwwww…But, a few weeks ago I decided that keeping a portion of my waste out of landfills was more important than my personal phobias. It was time to grow up, face my creepy crawly fears, and set up my own worm compost in my apartment. So this is what I did, and what you can do very easily too. 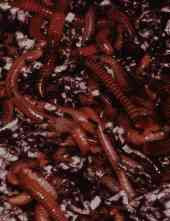 I ordered one pound of red wiggler worms. I got mine from Happy D Ranch. If you live anywhere near a farm, you can just go and ask for some red worms and they will probably accommodate, which is cheaper and less energy-sucking than mailing. Just make sure you get red worms (Eisenia fetida) or red wigglers (Lumbricus rubellus) because other worms are not suited for composting. I couldn't find anywhere near me that has red worms, so I paid $38 (including shipping) for my pound. Happy D also threw in a "Promote Global Worming" bumper sticker...how very clever. I got a wooden box, and drilled some holes in it for air and drainage. 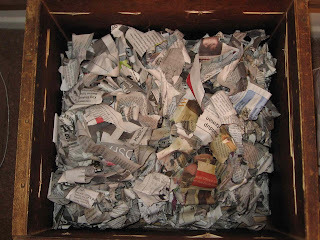 I made the bedding, out of newspaper, cardboard (I knew I’d been saving those toilet paper rolls for something), a little sawdust from drilling the holes, and a couple handfuls of dirt. All the websites I read instructed me to get the newspaper strips wet, like a wrung-out sponge. I was super-paranoid about the level of moisture (what if it's too wet and they drown, too dry and they dehydrate? ), but I think I eventually got it right, and after all, worms are hardy. Only use black and white newspaper--put those "adult ads" at the back of the Weekly to good use. So there was only one thing left to do. Open the worm box. Perhaps I shouldn't be admitting this publicly, but I almost had a nervous breakdown before I opened it. See, throughout the week, I started to realize that I was filled with dread every time I approached my door at night, for fear that they had arrived. Although I was anxious to get my composting going, I was secretly grateful each day that they weren't there. I figured, by the time they arrived, I would have done some mental strengthening exercises or something to prepare myself, right? So then, Friday night, I get home following after-work drinks, and there it was. I rationalized that they'd be ok for a few more hours until I was in a better state to deal with them in the morning, and after all, the box wasn't totally ready yet. 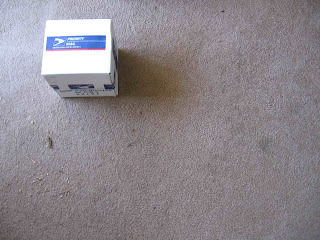 The next morning, after much hand-wringing and pacing, I finally approached the box. Although severely irrational, I was afraid that as soon as I cut the tape on the top of the box, worms would start pouring out, crawling all over my hands and covering my body. First cut. Nothing. Open flaps. Instructions from the ranch. Remove paper. A cloth pouch. Ok, I can deal with this. Unless they're all dead. I saw no movement. What if I've killed them before I even started? What if it was those few extra hours that killed them? I can't be going out for drinks now that I have life to sustain. Ok, I hovered over the bin, cut the pouch open and dumped the contents into the bin. It was a clomp of dirt. I saw no worms. After stepping back and realizing the worst was over, I approached the bin and used a wooden spoon to break open the dirt. Worms came cascading out. By this time, my fear of vermi-infestation had been replaced by vermicide, so I was just relieved to see life. I hadn't killed them before I started, after all...hoorah! The rest was cake. I fed them the scraps I had been saving for the past week. Banana peels, apple cores, wilty leek leaves, and coffee grinds. 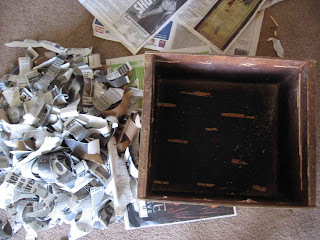 I covered the layer of scraps with another layer of moist bedding, and covered the bin. In case you're wondering, there is no smell, since the food is buried. 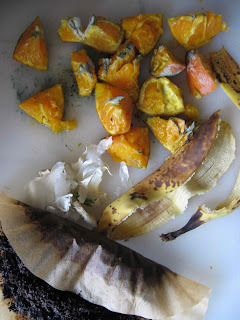 Per Molly's suggestion below, store to-be-composted scraps in the freezer to prevent odors before they get buried. It's been a week now, and I've checked on them every day or so just so see what's going on in there, but I actually can't see much other than wiggling, which is always a relief. I'm just about to add my second round of food. They can eat up to thrice their weight in food every week, which means three pounds for now. (Eventually they'll reproduce and I could feed them even more than that.) I still am unsure about how I sustain the moisture level going forward, so I'll be doing some vermi-research going forward. After a few months, I'll be able to start harvesting the worm castings--the super-rich compost that the worms poop out. Since I don't have a garden, I'll be doling out this rich, natural fertilizer to friends who do grow things. Want some? I'll keep you updated on how my wormies progress. Moral of the story: In nature, nothing is waste--even what we consider trash has a vital role in the life cycle. Composting is an essential we can get the balance a little bit more right. Vermicomposting is an easy, viable option for urban dwellers. If the biggest wimp in the world can allow worms into her home, anyone can. Maybe I'll even let them crawl on my hand one day soon. This is so cool! Thank you for posting this! I was thinking there's no way for me to compost since I live in an apartment, but that looks completely do-able! =) I can't wait to make my own! Hello, always great to meet a fellow worm farmer! My husband started his worms a few years ago but due to a storm and damage to our home, a lot was put on hold. They're back! It has been a year and a half since he started up again and we now have a second bin, oh boy! We use the castings in our garden and concentrated worm 'tea' for our indoor plants. We also give some to friends and family when we have extra. I too have a creepy-crawly-slithery phobia. I haven't mustered up enough courage to actually touch them yet but I visit with them often. They are cute in a way. My job is helping with the food preparation. I love the freezing tip, hadn't thought of that. Thanks. 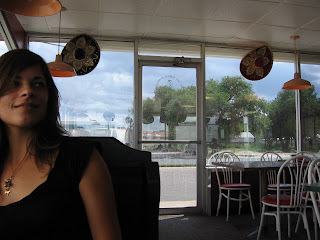 April 7, 2007-the day I got married!! Your wormy post interested me because I recently read a great book about vermicomposting entitled Worms Eat My Garbage: How to Set Up & Maintain a Worm Composting System by Mary Appelhof. It's a fabulous book loaded with useful information, and I'd recommend it to your blog readers who are interested in taking the composting journey. Something neat...Someone from Happy D Ranch reviewed the book on Amazon! An Original recording of a Lady GaGa Hit was Found this afternoon with no traces of where it came from.